In August 1961, the East German government ordered the erection of the Berlin Wall. Since then, many attempts were made to dig tunnels through Berlin’s sandy soil in order to overcome the heavily guarded border. The first tunnel was dug in October 1961, the last one in 1984. There were more than seventy escape tunnels in all; and in total, more than 300 citizens of the GDR were able to escape through those, which were successful. When the East German secret police (Stasi) learned of these operations, the outcomes differed. Sometimes this lead to spectacular cloak-and-dagger operations, other times to betrayal and bitter failure. A cat-and-mouse game played between the tunnel builders and the Stasi, meant that those wished to escape faced ever worsening odds. Tour M gives you an insight into the history of these escape tunnels, and delves into the subject of the subterranean border – in the subway and sewer systems, which were used by those trying to flee the east. 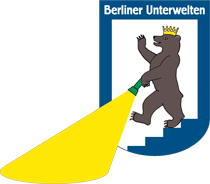 After a visit to various photo exhibitions in a former civil defence shelter, our guests will be taken via the subway to Bernauer Strasse. There more than seven escape tunnels were attempted within a distance of just 350 meters of each other. Here you will hear tales of betrayal in addition to the story of the two most successful tunnels. After the tour we recommend a visit to the Berlin Wall Memorial documentary centre. Sturdy footwear is obligatory (no sandals or flip flops!). Please read our important notes about our tours. Our tours and exhibitions are not appropriate for children under 7 years of age. We regret that we must therefore refuse entry to children in this age group. The delivery and content of our tours is aimed at adults, and can only be recommended for children aged 14 years or older. Due to limitations imposed by the structure of the buildings, our tours are not handicapped accessible. all year: Thu - Mon 3.30 p.m.
Apr - June | Sept - Oct: Tue + Wed 3.30 p.m.
July + Aug: Thu - Mon 1 p.m., Tue + Wed 1 p.m. + 3.30 p.m. The tour schedule is subject to change. Additional tours around national holidays are displayed in the calendar. Our General Terms and Conditions are applicable. We do provide an English translation as a courtesy; however, it does not replace or amend the original German Terms and Conditions. The times for tours in other languages can be seen by visiting their respective pages, or via the calendar function. Reservations are not possible for this tour and tickets can only be purchased on the day of the tour. Please arrive earlyto buy your tickets – expect queues on busy days. We are unable to spontaneously accommodate large groups on the public tours as they are designed for and aimed at individual guests. For this reason, ticket sellers will not allow one person to buy more than five tickets. Groups can book this tour on request (as of January, 2018). Please visit the section: GUIDED TOURS > TOURS FOR GROUPS for more details. Groups can book this tour on request. Please visit the section: GUIDED TOURS > TOURS FOR GROUPS for more details. Reservations are not possible for this tour and tickets can only be purchased on the day of the tour in our Ticket- and Bookshop. Please arrive early to buy your tickets – expect queues on busy days.